Biointegration involves building habitats and ecologies into architecture and urbanism, from living walls to urban forests, concepts I explore with Professor Alex Felson’s Urban Ecology and Design Lab. While bringing residents into closer contact with nature, this approach takes advantage of ecosystem benefits like storm protection and pollution mitigation. I am also exploring how the “designed experiments” Alex builds into inner-city landscape designs can encourage participation, turning local residents into amateur ecologists and water quality monitors. Bioprocess involves biological processes in design or construction, using organisms to make materials, generate structures, or be part of dynamic, self-healing buildings and infrastructure, in tandem with more advanced computational tools. This idea is central to David Benjamin’s work at The Living, where I interned this summer, researching the possibilities of using termites for wood processing and speculating on the potential of genetically modified microorganisms as building and city components. Bioimpact covers building features designed to minimize impact on the local and global environments, but with a caveat: they cannot achieve their full potential unless the occupant interacts directly with them, and can visualize this impact. I continue my exploration of these concepts, begun in a college environmental psychology course, in environmental design courses with Professor Michelle Addington and in studio work. And I worked during Summer 2016 at The Living, which has designed pavilions and installations that, often using biological sensors, report environmental conditions real-time to residents. 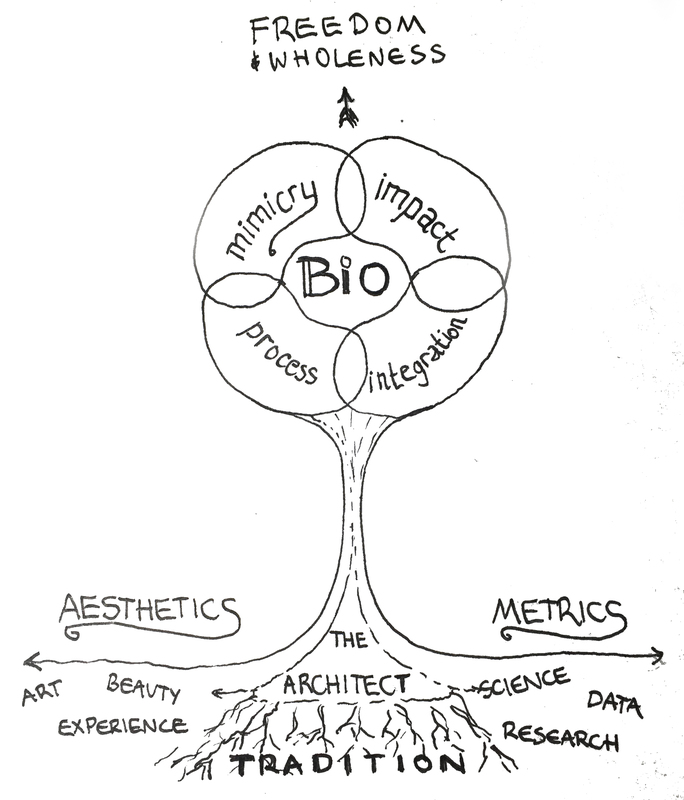 Biomimicry involves structures inspired by nature, including architecture that evokes the forms, scaling relationships, and sensory experiences found in nature, all of which have been found to correlate to well-being. This is a central part of Professor Stephen Kellert’s Biophilia research, which I helped with this Spring, but it is also something that my favorite architects—Gaudi, Soleri, Hundertwasser, Wright, Calatrava—tap into, and that my hero Christopher Alexander attempts to catalogue and turn into a series of rules. It is his belief—and mine—that traditional and classical architectures understood and embodied these principles as unspoken universals; this is why my work engages with historic architecture and urbanism. What do BioHumanist cities and buildings look like? The biophilic architecture of the past is a valuable guide, but much of it was based on the Renaissance conception that placed man at the center of a mechanically functioning, geometrically perfect, and static universe. Biohumanism still places human experience at the core of architectural design, but it integrates our new worldview based on chaos theory and quantum mechanics; it embraces the dynamism and uncertainty inherent in biological processes while celebrating our awe at the self-organized order they result in. Using the unprecedented wealth of tools available to designers in 2016, from computer simulation to 3d printing, I want to probe the possibilities for the creation of a new kind of human habitat that, in being as adaptable as an ecosystem, also gives its inhabitants true freedom. Through my research, I am interested in seeing how the aspects of biohumanism that I propose can be integrated in a wholesome way into a new aesthetic that can connect people to nature and natural processes. To that end, I am working with Kent Bloomer, Alex Felson, and Kassandra Leiva on a paper that proposes ornament as a vehicle for integrating green interventions into cities and buildings. In the future, taking my thesis in rules-based urbanism as a jumping-off point, I plan to develop Biohumanism into an adaptable toolkit applicable to a variety of contexts through the tools of design and legislation. these lists are currently UNDER CONSTRUCTION. If you know of any other relevant projects, please contact me!